There are many intangible benefits to gaining greater knowledge of your members. Knowing your members and understanding their product, service delivery and messaging, helps you to better serve them. Many marketing and member facing associates see the upside opportunity in using an institution wide platform for collecting, organizing, analyzing and then implementing targeted member marketing campaigns. However, when we have a senior financial person in the room the discussion always gets around to the claim that using member analytics does not only make your marketing more effective it saves your institution money. 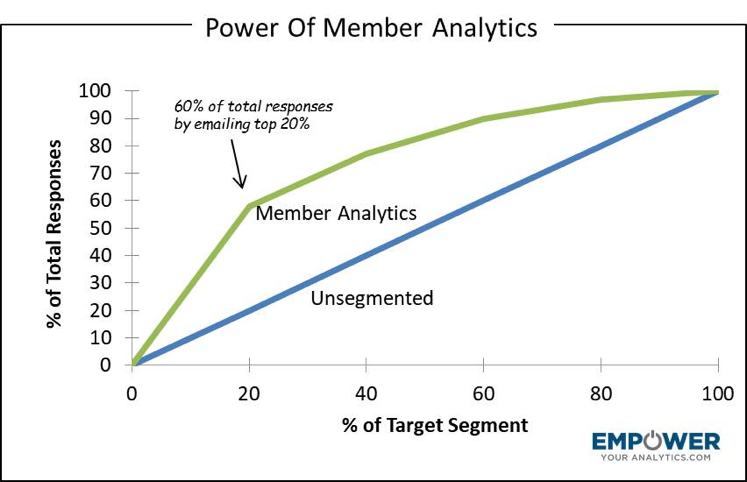 So, for all the CFOs, lets “do the math” on using member analytics. In very basic terms, for a data analytics function to reduce marketing expense, the increase in efficiency (lower cost per account opened) needs to create more revenue than the increased cost to design and build your new data analytics function. The increased marketing efficiency comes from new member insights that help target each member with the right product, at the right time, with the right messaging…increasing response rate to your marketing campaigns. Before going forward with the “math” I just want to briefly mention all the “intangibles” that come along with successfully using data analytics. Members clearly feel more connected to your brand when you are able to approach them with products and service delivery options that make sense for them. As an organization you are already doing this on an individual basis; being able to do it through media reinforces their affinity for your brand. The benefits of this increased affinity are; increased member longevity and increased share of wallet. The core concept of how member data analytics can save your credit union money is in its ability to target specific segments of members and creating a body of information/insights into understanding their preferences for products, service delivery and brand/messaging. By breaking down your members into groups of “like minded” individuals you can begin to target communications. This targeting improves the efficiency of your communications and as a result, you can achieve the same results with less spent on media. The chart below illustrates the power of using member data to create segments of individuals with similar lifestyle characteristics and as a result the same product and service delivery preferences. Targeting the appropriate product offer to this group using messaging appropriate to their age and income characteristics can clearly increase the responses to your campaign. Putting an example with the chart below will help it make more sense. It’s spring and your credit union is planning to do a home equity line of credit promotion. The promotion will include the usual list of in-branch and member communications and this time you are doing a traditional direct mail campaign. to members as well. If you were to send out your mail solicitation to a random group of members the response curve would resemble the straight line of the unsegmented group in our chart. It is a straight line because in pulling the random list of member names you did not use any additional member data to narrow the focus (or target) the mailing list. The response curve on the data analytics is quite different. By using data analytics, we are able to gather 60% of the total estimated responses by mailing only 20% of the total list. In our example, we began our targeting by looking at member segments that have demonstrated a predisposition for using home equity lines of credit. We can then narrow this targeting further by looking at additional data associated with these members. This additional information might include; do they have children? How old are the children? How long have they owned their home? What is their affinity for your credit union? Because we segment all members into groups by age and income and we can look at their current product usage and service delivery preferences and then tailor the “creative “(messaging, product attributes to highlight and media) to make the offer more appropriate for their lifestyle, preferences and product needs. It is this ability to target specific members and to offer them the right product, at the right time, in the right manner that improves responses and reduces the amount of media (and media expense) to achieve the same results. –Or- you can keep your budget the same and increase growth and revenue using the same budget. Reducing your member marketing expense not only comes from knowing more about your member’s financial needs, it comes from being able to identify what media/creative combinations resonate with identifiable segment of members. This matching of media/creative with identifiable member segment is accomplished by creating a member specific promotional history. This history records the various campaigns that each member receives and records their response (or non-response). This functionality permits the testing of media, offer, messaging, creative and pricing. So, the more member campaigns that you run, the more you learn about what campaign tactics work the best. Risk of signing a long-term contract without clearly defined goals. Most data analytics solutions are designed for larger institutions, with a larger member base. A short-term initial (90 days) “trial” contract, so you are not locked in. The service is up and running in 45 days, minimal client resources are required. It is a learning tool for your leadership team on how to use data analytics. In fact, all clients receive a full day workshop with the delivery of the new database to help them better understand their member data. Analytics/Marketing/Campaign Development support is available for institutions introducing data analytics into their marketing; providing the resources and expertise to make the new member database a success. As seen in industry research, using member data to enhance marketing efforts is one of the top goals for credit unions in 2018. If you are in the early stages of your project, we would encourage you to “do the math” and find a trusted resource to guide your organization through the planning, designing and implementing of a successful data analytics function.